Have you been thrifting, refashioning, sewing or crafting this week? Would you like to participate in Recycled Fashion Finds? Click here for last week's submissions. Feel free to share more than one project or thrifty find, I always love to see what you've been up to. 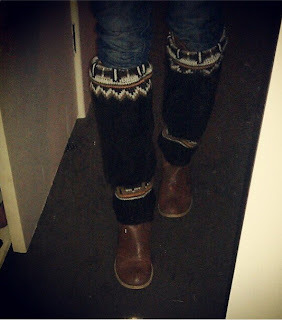 Whilst I've not been sewing this week, except final touches to my dress with a story, I did find a new way to wear my sweater-sleeve-turned-leg-warmers; over the top of my second hand knee high boots. Oh yes! Click here for Recycled Fashion Find's rules, and don't forget to grab yourself a Recycled Fashion Finds blog badge for your blog post or side bar. Great leg warmers! I enjoy this link-up so much. Those leg-warmers look great. I wish we had cold weather in Singapore - but then again, that would mean wishing for extreme weather change! Thanks for hosting!